Starring Sam Rockwell, Taraji P. Henson, Babou Ceesay, Anne Heche, John Gallagher Jr., Wes Bentley, Bruce McGill, Nick Searcy, Sope Aluko, Caron Holmes, Nicholas Logan, Gilbert Glenn Brown, Caitlin Mehner, Dolan Wilson, Morgan Mackey, Jennifer Sears, Wes McGee, Kendall Ryan Sanders, Chris Cavalier, Malerie Grady, Ryan Dinning, Najah Jackson and Bethany DeZelle. Distributed by STX Films. 133 minutes. Rated PG-13. I love when a film presents an incredible, true life story that has been brushed over in the history classroom. 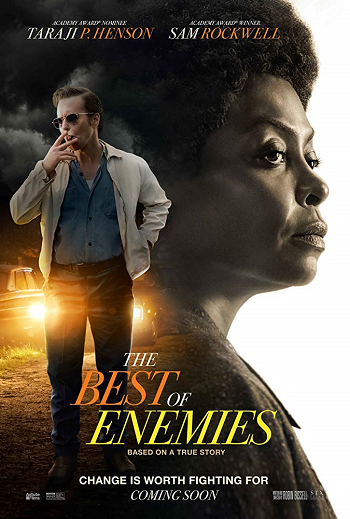 The Best of Enemies does just this in its retelling of a tense and important two-week period in Durham, North Carolina history that finally led to the city’s public-school integration. The film tells the story of Ann Atwater and CP Ellis, two local leaders of two very opposite “sides” of their community. They are chosen by moderator Bill Riddick to co-chair a charrette to allow the community to reach a decision on school integration. It was a ruling that had been ordered by the NAACP, but one that the all-white council members felt their community could continue to resist against. Now, how many of you have heard of Ann Atwater, CP Ellis, Bill Riddick or even a charrette? I suspect few if any. And this happened in 1971. The Best of Enemies introduced both of the main characters fairly. Ann Atwater (played by Academy Award Nominee Taraji P. Henson) is bold and brash and at times, unpredictable. She is a fighter, a single mom since the age of 16 turned grassroots community organizer. As she says in several points during the film, it’s what she does. She has the ear and heart of her community in a town where a councilman will literally turn his back on Ms. Atwater every time she comes to speak in front of the council. Yet, she never gives up. She is obviously someone you want to root for and wonder why you’ve never heard of her before. CP Ellis (played by Academy Award Winner Sam Rockwell) is also a leader in his community. He is his Ku Klux Klan chapter’s Exalted Cyclops, who has innovated his chapter by including the town youth for further reach. He lives by the Klan’s creed – their crowning glory is to serve. He is also a husband and father to a teenage daughter and a young man institutionalized with Down Syndrome. His wife, Mary (played by Anne Heche), while accepting of her husband, never bought into his beliefs. He runs a gas station and finances are hard. For sure, I was never going to root for a Klan member, but the film did a good job at showing some of his humanity, in spite of his hateful beliefs. Bill Riddick (played by Babou Ceesay) is the mild mannered, well spoken moderator specifically requested to run Durham’s 1971 charrette, which is defined as a final, intensive effort to finish a project, especially an architectural design project, before a deadline. He has the responsibility of initiating the process and gaining buy in from both Atwater and Ellis to co-chair the group. He still lives outside of Raleigh as he has done since 1969. He is portrayed as a quiet hero, moderating between two forces of nature. Having said all of this, perhaps I am being a bit too critical? My movie mate enjoyed the film, feeling like the story made up for the other shortcomings and the audience was audibly pleased with a lot of the dialogue flow. Overall, my impression was: great story, Hallmark channel quality film. I guess you will have to judge for yourself. I, myself, will choose to read the book The Best of Enemies: Race and Redemption in the New South by author Osha Gray Davidson before considering a second viewing of the film. Tags: Ann Atwater, Anne Heche, Babou Ceesay, Bethany DeZelle, Bill Riddick, Bonnie Paul, Bruce McGill, Caitlin Mehner, Caron Holmes, charrette, Chris Cavalier, CP Ellis, Dolan Wilson, Durham, Gilbert Glenn Brown, Jennifer Sears, John Gallagher Jr., Kendall Ryan Sanders, Ku Klux Klan, Malerie Grady, Morgan Mackey, movie review, Najah Jackson, Nicholas Logan, Nick Searcy, north carolina, Osha Gray Davidson, PopEntertainment.com, Race and Redemption in the New South, Robin Bissell, Ryan Dinning, Sam Rockwell, Sope Aluko, Taraji P. Henson, The Best of Enemies, The Best of Enemies: Race and Redemption in the New South, Wes Bentley, Wes McGee. Bookmark the permalink.